The main house with it’s attractive eyebrow window has two bedrooms and a small closet type room, which could be used as a third bedroom especially for children. It also has a family bathroom, fitted kitchen lounge/diner with woodburner, study and a conservatory is built onto the back of the house to enjoy the views. A separate laundry room is attached to the side and this has room to also be used as a larder and for storage of other things as well as internal hanging space for drying clothes during those occasional rainy days. To the back of the laundry room, attached to the house is a tool/bike shed, with power supplied. 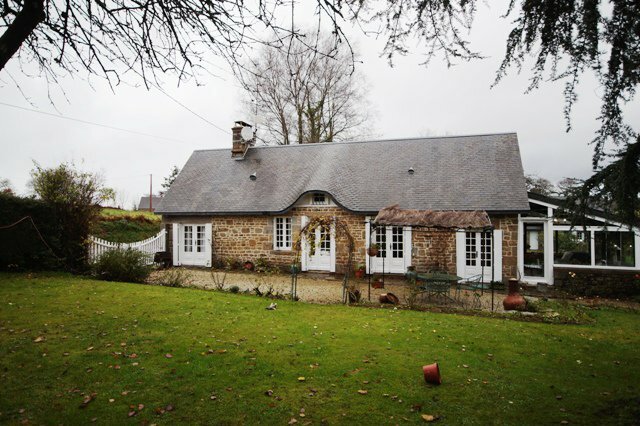 The separate gite with attached open double garage comprises of a two storey living room space, with a wood burner, a mezzanine bedroom and a large modern shower room. Above the garage are two further rooms one could be used as another bathroom as it has water supply, which are ready for development and could be used for a multitude of purposes, e.g. bedroom, games room, office et cetera. The property is heated in the main house with gas central heating, and a very efficient wood burner and in the gite with a wood burner, supplemented by electric radiators. Although the current owners have never rented out the smaller house, it would be ideal if you are looking to generate an income.